Let's call it CGMBSL to save time and energy, but what really should be said first is, If CGMBSL ain't a roman a clef, it ought to be. The author is a native Oklahoman, and he's part Native American, and he served in the U.S. Peace Corps, in Costa Rica no less. We learn that from the short author biography. 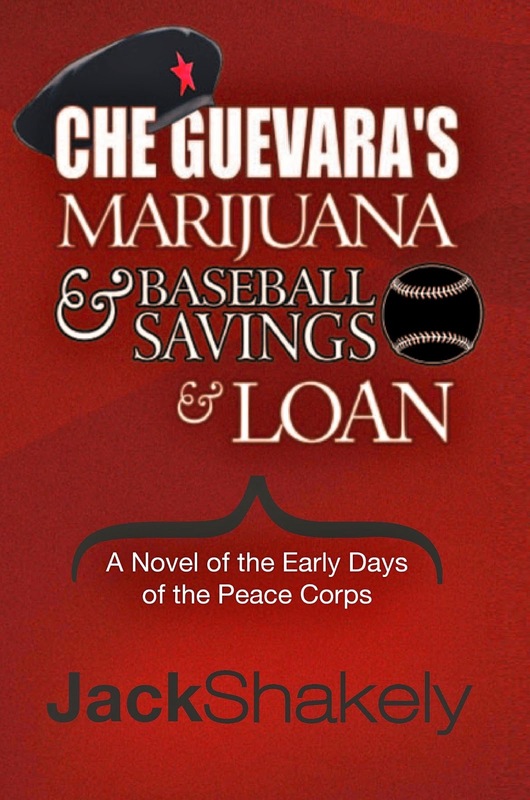 Despite those fundamental similarities, Jack doesn't admit to playing baseball with Che, being framed in a marijuana smuggling operation, nor being exiled in Paraguay. But we've never had Jack Shakely under a lie detector test, have we? First, let's classify this comic novel. CGMBSL is a little Carl Hiaasen, a little P. J. O'Rourke, with a splash of Hunter S. Thompson. But Shakely isn't imitative. He has a voice all his own—part Okie, part sophisticate, part Indian (you need to have Native American blood kin to understand that last reference), and full pleasure. Shakely's also an experienced author—novels to his credit include The Confederate War Bonnet and POWs at Chigger Lake. Now, the plot. The protagonist is one Jack Harjo, a young man who had a magical childhood in rural Oklahoma, near Ardmore. His father was John, part Creek and lucky enough to own a little Ardmore oil patch. His mother, Elizabeth Langhorne Harjo, fire-breathing New Deal-LaFollette-Woody Guthrie, was an editorial writer for the Ardmorite and scourge of Congressman Arthur Wickerman, he of Commie Pinko Joe McCarthy is too damn liberal fame. Jack works part-time at the paper growing up, schooled by his mother and hard-drinking Old Bob Hogan in the art of the pen, and then he's off to Norman to attend the university. He'd rather have played pro baseball, but his Cushman Eagle motorcycle had other ideas, one of which was broken bones—a 'cycle crash left Jack with injuries that ruined any chance of competing at baseball's higher levels. While at OU, he meets folks like Larry Reznick, seventh-year junior, who'll show up later in the narrative, and Judy, a girl with "an unruly nimbus of red hair that looked like it was staging a prison break" whose father happens to be Arthur Wickerman, the pol who's demagoguing about commies under beds. Jack shtups Judy. Forget the psychological motivation. It's fun. Shakely is dead-on in his descriptions of the milieu of a college town, especially of off-campus life and the characters—you'll like Zelda, Nigel, and General Tom—and his segue into the idealistic arms of the Peace Corps is entirely believable circa 1963 and the Kennedy-era charismatic idealism. The rabbit hole for the whole adventure opens in Costa Rica. Jack is sent to the border village of San Isidro smack up against Nicarauga—Che being present there, according to Mr. Harjo, fomenting revolution against the sinister Somozas—where he, Mr. Harjo, that is, more or less prospers in a boy-with-thumb-in-the-dike way (think cacao, banana, and sewing cooperatives). Harjo's helped by Victor Victorin, a Costa Rican from a prosperous family who had been part of the training program stateside. The aforementioned Larry Reznick, exiled drug-dealer and wizard accountant, reenters stage right. Judy? She didn't make the PC cut, although she was able to dump Jack and bed Victor. Don't worry. Thanks to daddy's help, she lands on her feet. But let's not give away all the surprises, the twists-and-turns, the wicked funny observations, and sad realities. Let's simply say, as with the his life and times of Collegeworld, Shakely hits the mark with his innocents abroad take on Peace Corps life in Central America. There are dedicated folk. There are useless folk. There are administrators trying to make a difference. There are administrators who would be over their heads in attempting to organize a softball game at a family picnic. Folks visit from Oklahoma and help. Daddy Harjo provides excellent advice. Jack does meet Che. There's beisbol. The cooperatives prosper. Judy shows up in the form of stringer-correspondent for a big-time magazine and inveigles an introduction to Che. A Keystone Kops effort is made to overthrow the Somozas. While Judy tangles sheets in other beds, Jack meets a nice girl, Collette Johnson, "born church-mouse poor on the south side of Chicago ... who was Judy turned inside out in almost every conceivable way." Here's where Shakely does an extra fine, count-me-impressed job of writing, one that even a regular book reviewer rarely sees. He writes an interracial romance, a believable love story, in which race plays no part. There's no plot point involved. There's no political statement. There's no agenda. There's minimal mention of color. Jack loves Collette, "country smile and sassy street-wise mouth," and that's that. There are faults in the book, true, but it's hard to find them if you're a fan of the genre, and they are not so blatant and colorful as to disguise the book's charm. One that left me frustrated—and that only because I was enjoying the tour—was the rapid transition from Costa Rica to Paraguay. Maybe Shakely's saving that for another novel. Too delve too deeply into how Jack finds himself writing Collette in Chicago, "Please come to Paraguay. I miss you. I need you. I love you." will give away too much of the story, but I can give you a hint: Larry; Judy; drug smuggling; money laundering; Cartagena; and contempt of Congress. Don't let that fool you. Jack's innocent. "The absence of evidence is not evidence of absence."